Complementation assays performed in a 96-well format in two different yeast strain backgrounds (Supplementary file 1). (A and B) Magic marker heterozygous diploid deletion yeast strains expressing E. coli genes were sporulated and the sporulation mix was spotted on magic marker agar medium (-Ura -Arg -His -Leu + Can) with (yeast gene absent) or without (yeast gene present) G418 (200 μg/ml). (C) Temperature-sensitive haploid yeast strains expressing E. coli genes grown at permissive temperature (25°C) (yeast protein active) and at restrictive temperature (36°C) (yeast protein inactive) on -Ura agar medium with G418 (200 μg/ml). Empty vector containing yeast cells were used as negative control for the experiment. (D) Haploid yeast gene deletion strains carrying plasmids expressing functionally replacing E. coli genes (red solid-lines) generally exhibit comparable growth rates to the wild type parental yeast strain BY4741 (black dotted-lines) as grown in YPD liquid medium in the presence of G418 (300 μg/ml). Mean and standard deviation plotted with N = 3. 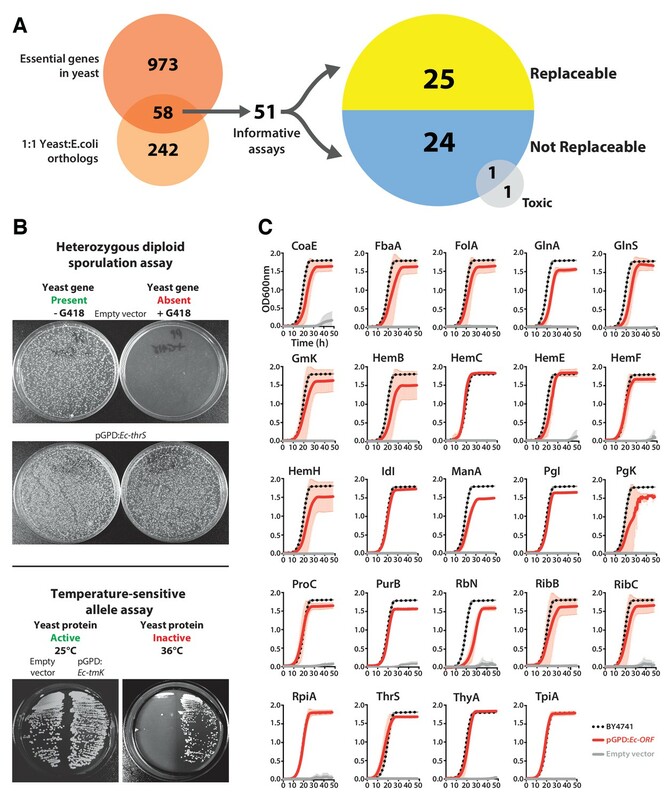 Constitutive plasmid expression of yeast genes efficiently replaced the corresponding genomic copies for 6 non-replaceable alleles. 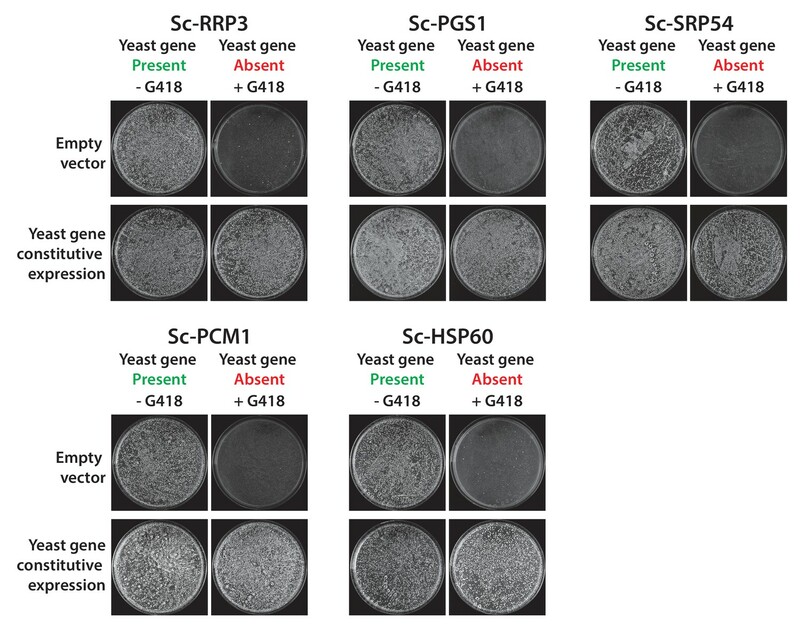 Bacterial orthologs of the yeast genes, Sc-RRP3, Sc-PGS1, Sc-SRP54, Sc-PCM1 and Sc-HSP60 did not show functional replacement when expressed from a constitutive GPD promoter. We expressed the corresponding yeast genes in a similar fashion under the control of the constitutive GPD promoter. All the tested yeast genes functionally replaced the corresponding yeast gene deletions. Empty vector containing yeast cells were used as negative control for the experiment. Some E. coli genes require a yeast mitochondrial localization signal to efficiently replace. The magic marker heterozygous diploid deletion yeast strains carrying empty vector or E. coli gene with or without MLS were sporulated and the sporulation mix was plated on magic marker agar medium (-Ura -Arg -His -Leu + Can) with or without G418 (200 μg/ml). E. coli genes Ec-rpiL, Ec-ilvC, Ec-ilvD and Ec-hscB without an appropriate mitochondrial localization signal cannot complement the corresponding yeast gene deletions Sc-mnp1, Sc-ilv5, Sc-ilv3 and Sc-jac1. However, expression of E. coli genes with yeast MLS efficiently rescued the growth defect of the corresponding yeast gene deletions. 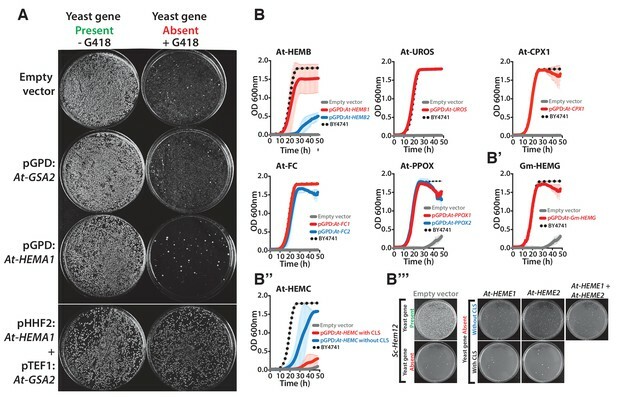 Constitutive or native plasmid-based expression of the yeast heme biosynthesis genes generally efficiently complemented growth defects in the corresponding yeast gene deletion strains. 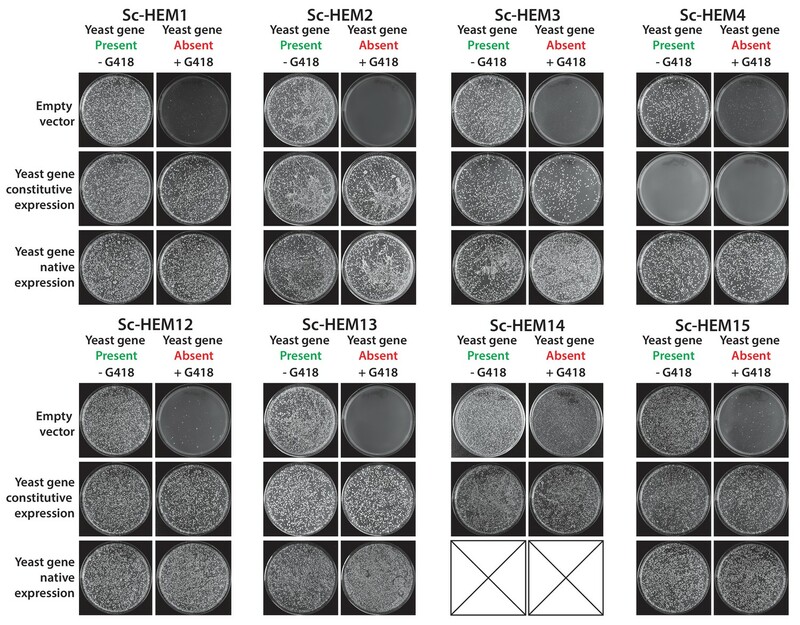 Heterologous expression of yeast genes Sc-HEM1, Sc-HEM2, Sc-HEM3, Sc-HEM4, Sc-HEM12, Sc-HEM13, Sc-HEM14 and Sc-HEM15 under the control of constitutive GPD promoter or native promoter efficiently rescued the growth defect of the corresponding yeast gene deletions respectively except in the case of Sc-HEM4. 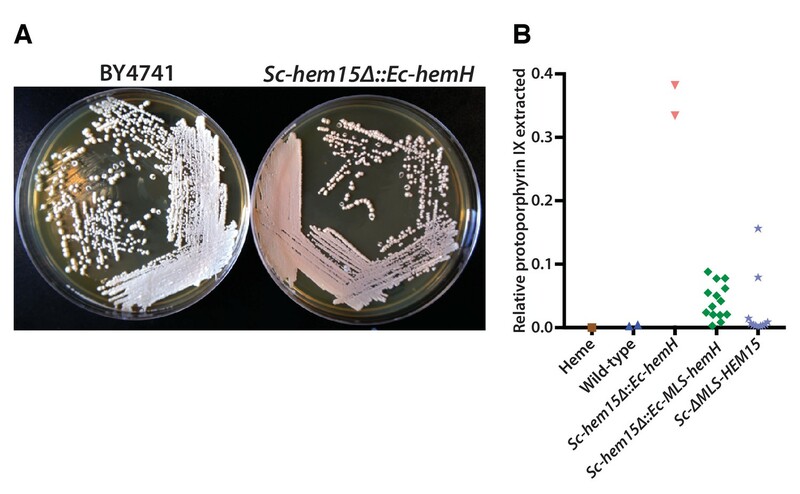 Sc-HEM4, when expressed constitutively, resulted in toxicity in the presence of the yeast gene at the native locus and did not complement the function in the absence of the yeast gene. This toxicity was relieved when the yeast gene was expressed under the control of the native yeast promoter. Ec-hemA and Ec-hemL carry out the initial reaction in E. coli heme biosynthesis and are both required to complement Sc-HEM1 deletion in yeast, and non-orthologous yeast genes are replaced by E. coli genes that carry out the identical reaction. (A) Expression of heme pathway genes of E. coli, Ec-hemA or Ec-hemL, individually cannot complement the lethal growth defect of the deletion of Sc-HEM1 gene in yeast. 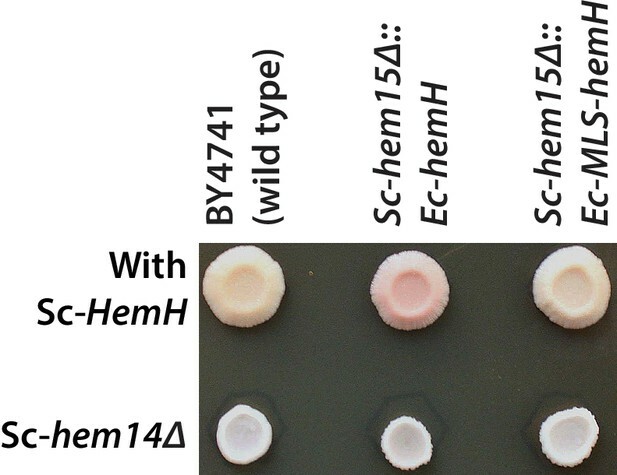 Co-expression of Ec-HemA and Ec-HemL efficiently rescued the growth defect of Sc-hem1 gene deletion in yeast. (B) Growth curves of yeast strains with deletions of Sc-hem4 and Sc-hem14 genes (grey solid-line) show functional replaceability (red solid-line) by the non-orthologous E. coli genes Ec-hemD and Ec-hemG that carry out identical enzymatic reactions to the corresponding yeast genes. The wild type BY4741 growth curve is shown as a comparison (black dotted-line). The empty vector control (grey solid-line) showed no such growth rescue in the presence of G418. (C) Growth curve of engineered yeast strain Sc-hem14Δ::Ec-hemG; Sc-hem15Δ::Ec-hemH in YPD medium harboring E. coli genes at the native yeast loci. The strain displayed a growth defect (red solid-line) compared to the wild type BY4741 strain (black dotted-line). Mean and standard deviation plotted with N = 3. The penultimate and ultimate heme pathway enzymes in yeast are replaceable by their bacterial orthologs, in spite of mis-localizing to the plasma membrane. EGFP-tagged Ec-HemG and Ec-HemH localize to the plasma membrane in yeast. The EGFP-tagged proteins do not localize to the mitochondria since no clear co-localization is observed with the Mitotracker red stain. EGFP-tagged Ec-HemG and Ec-HemH expression (red solid-line) efficiently rescue the growth defects of the respective yeast gene deletions (Sc-hem14 and Sc-hem15) (pink dotted-line) comparable to the wild type yeast (black dotted-line). Empty vector control is incapable of rescuing the growth defect of the deletion strains (grey dotted-line). 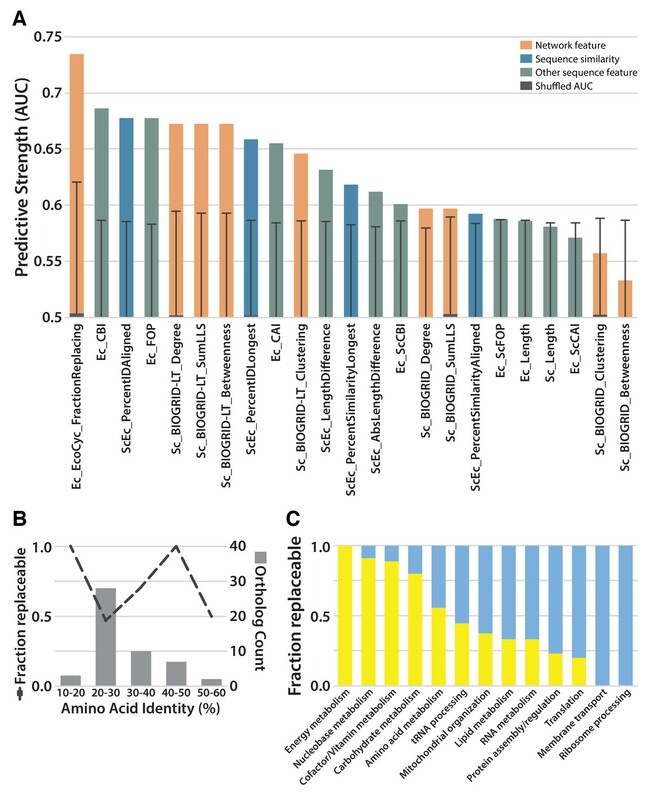 Confirmation of CRISPR-Cas9 mediated bacterialized yeast strains. 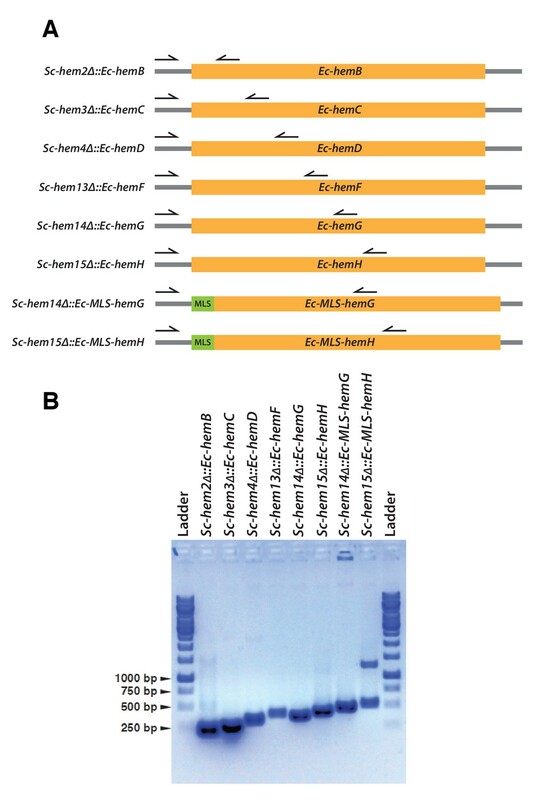 (A) Schematics of the yeast heme pathway gene loci carrying functionally replaceable E. coli genes while retaining their native promoters and terminators. The arrows indicate the primers used to confirm the replacement (refer to Supplementary file 3). 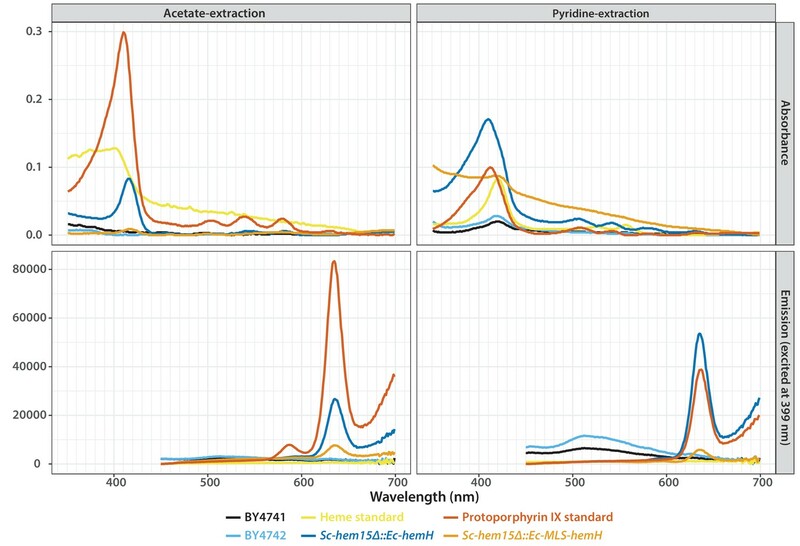 (B) PCR amplification of expected size was obtained for each individual bacterialized yeast strains. Absorbance (top) and emission (bottom) spectra of extracts obtained from acetate (left) and pyridine (right) extraction of the wild type or bacterialized yeast colonies grown on YPD medium. Purified protoporphyrin IX (red solid-line) or heme (yellow solid-line) were used as standards. Extract from the bacterialized Sc-hem15Δ::Ec-hemH yeast strain (dark blue-line) matched with that of the protoporphyrin IX standard. Bacterialized ScHEM15Δ::Ec-MLS-hemH yeast strain (orange solid-line) showed significantly reduced peak for protoporphyrin IX. Extracts from wild type BY4741 (black-line) and BY4742 (light blue solid-line) were used as controls. 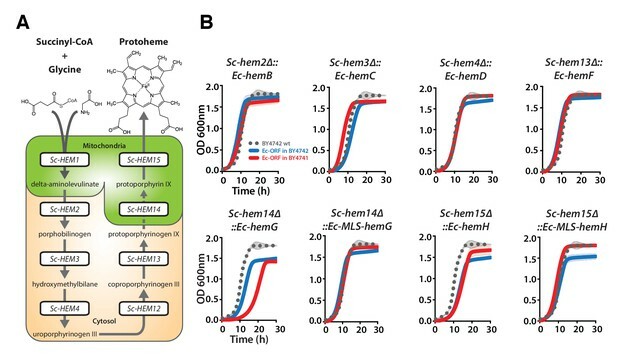 Deletion of protoporphyrinogen oxidase, Sc-HEM14, in the Sc-hem15Δ::Ec-hemH strain suppressed the porphyria-like pink phenotype. Top row from left show growth spots of the BY4741 wild type, Sc-hem15Δ::Ec-hemH and Sc-hem15Δ::Ec-MLS-hemH yeast strains. Bottom row from left show corresponding strains harboring Sc-hem14 deletion. Heme biosynthesis genes from Arabidopsis thaliana and Glycine max generally efficiently replace their counterparts in yeast, except in the case of ΔSc-Hem12. (A) Expression of heme pathway genes from Arabidopsis thaliana, At-HEMA1 or At-GSA2, individually cannot complement the lethal growth defect of the deletion of Sc-hem1 gene in yeast. Co-expression of At-HEMA1 and At-GSA2 rescued the growth defect of Sc-hem1 gene deletion in yeast. (B) Haploid yeast gene deletion strains carrying plasmids expressing functionally replacing Arabidopsis (red or blue solid-lines) and (B’) Glycine max (Gm-HEMG) heme pathway genes (red solid-line) generally exhibit comparable growth rates to the wild type parental yeast strain BY4741 (black dotted-line) as grown in magic marker liquid medium in the presence of G418 (200 μg/ml). (B’’) Native At-HEMC with chloroplast localization signal (CLS) showed poor replaceability in yeast (red solid-line). Removal of the CLS from At-HEMC allowed efficient rescue of the corresponding yeast gene deletion, ΔSc-Hem3 (blue solid-line). (B’’’) However, neither the expression of Arabidopsis proteins At-HEME1 or At-HEME2 (with or without CLS) alone nor their co-expression could functionally rescue the corresponding yeast gene deletion, ΔSc-Hem12. Wild type BY4741 haploid strain is plotted for comparison (black dotted-line). Strains carrying empty vector were used as controls (grey solid-line). Mean and standard deviation plotted with N = 3. 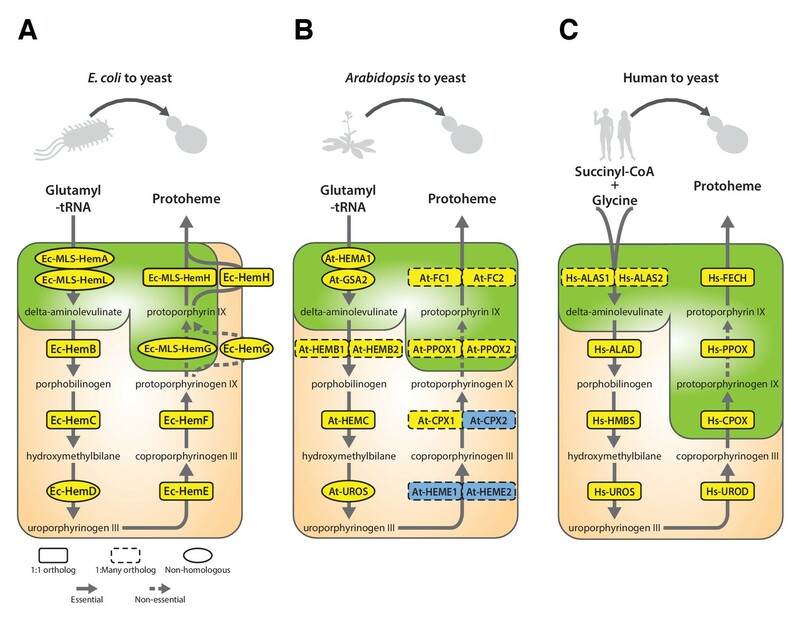 Heme biosynthesis enzymes normally localized to plant chloroplasts or human mitochondria localize to the mitochondria when expressed in yeast. (A) EGFP-tagged penultimate At-PPOX1-EGFP and ultimate At-FC1-EGFP proteins localize to mitochondria in yeast. Green fluorescence proteins co-localized with Mitotracker red-stained mitochondria. In certain cases, At-FC1-EGFP formed aggregates. Expression of EGFP-tagged plant genes, At-PPOX1-EGFP and At-FC1-EGFP (red solid-line), efficiently rescue the growth defect of the corresponding yeast gene deletions (pink dotted-line). The over-expression of the tagged proteins is not toxic to the wild type yeast strain (grey dotted-line). The growth rescue by plant genes is as efficient as the wild type BY4741 yeast strain (black dotted-line). Mean and standard deviation plotted with N = 3. (B) The EGFP-tagged last three heme pathway genes from humans localize to mitochondria in yeast. 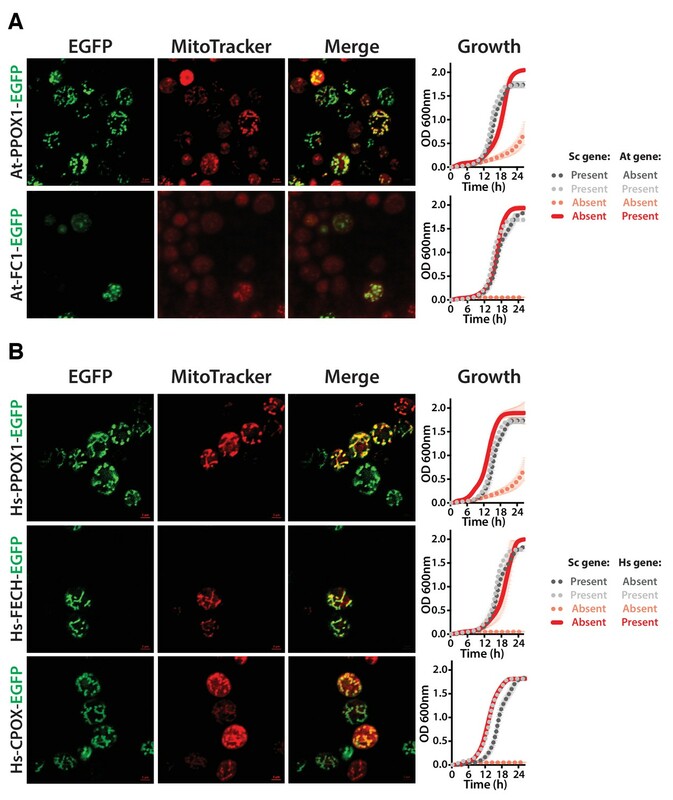 The green fluorescence co-localized with the Mitotracker red-stained mitochondria in yeast. Expression of EGFP-tagged human genes, Hs-PPOX-EGFP, Hs-FECH-EGFP and Hs-CPOX-EGFP (red solid-line), efficiently rescue the growth defect of the corresponding yeast gene deletions (pink dotted-line). The over-expression of the tagged proteins is not toxic to the wild type yeast strain (grey dotted-line). 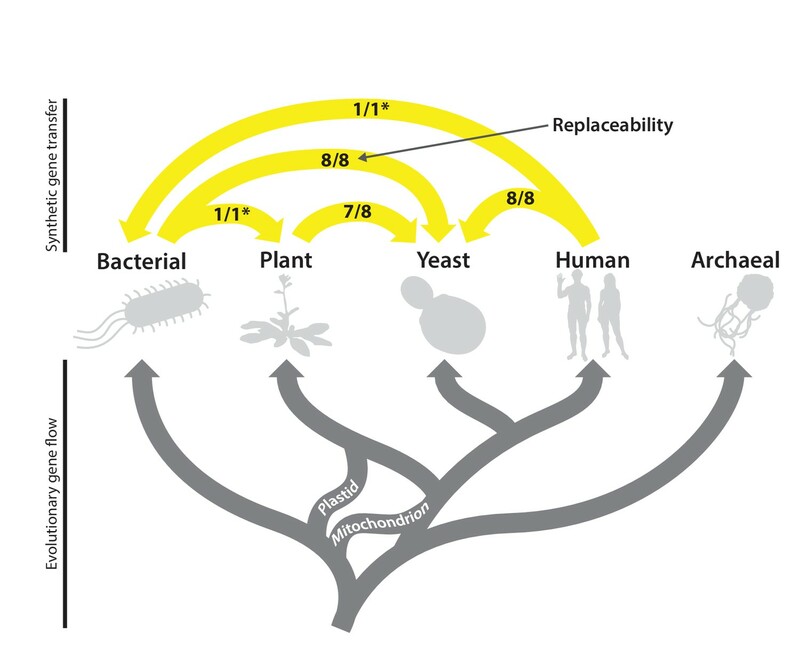 The growth rescue by the human genes is as efficient as the wild type BY4741 yeast strain (black dotted-line). Mean and standard deviation plotted with N = 3. Human heme biosynthesis genes efficiently replace their yeast counterparts. F﻿u﻿n﻿c﻿t﻿i﻿o﻿n﻿a﻿l ﻿r﻿e﻿p﻿l﻿a﻿c﻿e﻿m﻿e﻿n﻿t ﻿o﻿f ﻿h﻿u﻿﻿ma﻿n ﻿g﻿e﻿n﻿e﻿s ﻿i﻿n ﻿y﻿e﻿a﻿s﻿t﻿. 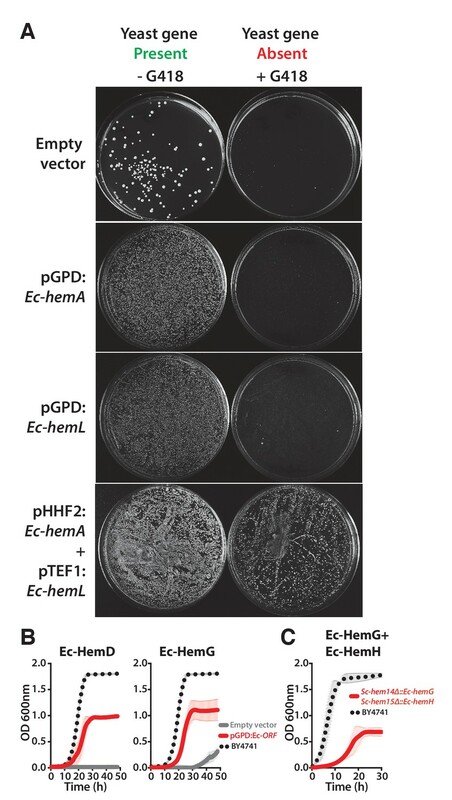 (A) Expression of Hs-UROS in Sc-hem4 heterozygous diploid deletion yeast strain resulted in toxicity post-sporulation as seen by the lack of growth on either magic marker agar medium with (yeast gene present) or without G418 (yeast gene absent). (B) This toxicity was relieved by replacing the human Hs-UROS at the native yeast locus. Growth curve of the humanized yeast Sc-hem4Δ::Hs-UROS strain (red-solid line) showed comparable growth to the wild type yeast BY4741 (black dotted-line). (C) Expression of human Hs-UROD (a human orfeome clone with G303V mutation) in Sc-hem12 heterozygous diploid deletion yeast strain did not complement the growth defect of the yeast gene as shown by plating the post sporulation mix on magic marker medium with or without G418. Reverting the sequence to the wild type Hs-UROD gene resulted in efficient rescue of the growth defect of the corresponding yeast gene. (D) Expression of human genes, Hs-PPOX, Hs-UROD, Hs-ALAS1 (red solid-line) and Hs-ALAS2 (blue solid-line), efficiently rescue the growth defect of the corresponding yeast gene deletions (grey solid-line), Sc-hem14 and Sc-hem1, respectively. The rescue was largely comparable to the wild type BY4741 yeast strain (black dotted-line). Strains carrying empty vector were used as controls (grey solid-line). Mean and standard deviation plotted with N = 3. Detailed results of complementation assays. Rows are ortholog pairs. Columns A-E list several alternative gene IDs for each organism. ‘Assay location’ is the location of that complementation assay in the plate images shown in Figure 1—figure supplement 1. The following columns list the results of the specific assay type: ‘MM’ refers to the heterozygous diploid assay (Magic Marker). ‘TS’ refers to the temperature-sensitive allele assay. ‘With MLS’ are assays re-done with the yeast mitochondrial localization sequence as described in the test. ‘With ATG’ are assays re-done with an ATG start codon substituted for the E. coli genes non-canonical start codon. ‘Plasmid dependence’ lists the results of 5’ FOA screening of complementing clones to confirm that the E. coli gene-containing plasmid is present. 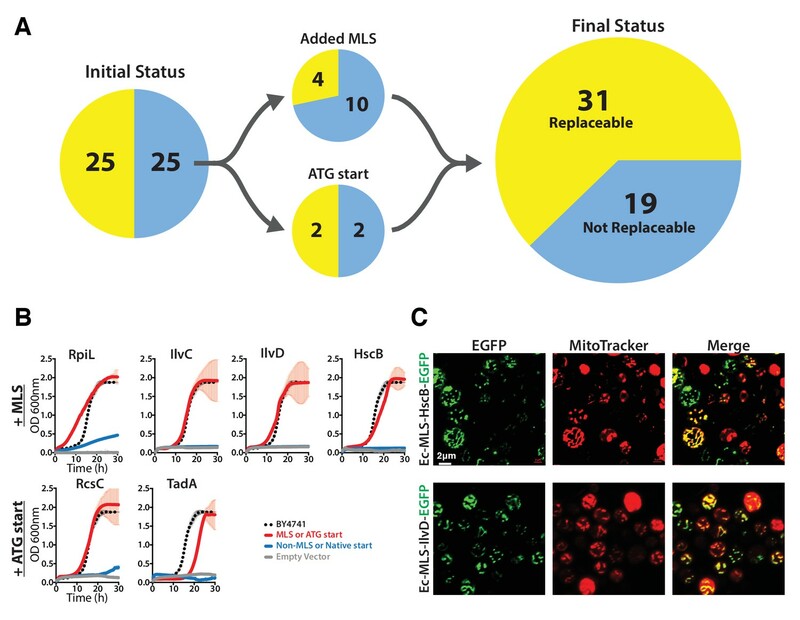 ‘Final status’ and ‘Preliminary status’ refer to the complementation status of the given ortholog pair after (Final) or before (Preliminary) accounting for MLS, ATG, or plasmid dependence assays. Data used to calculate predictive features. The first sheet displays all data for each property used in the study to determine predictive properties. The first several columns list IDs for the two organisms as well as the final complementation results. The following columns include all data for each feature. See Materials and Methods for detailed descriptions of each property. The second sheet lists the calculated AUCs for each feature, and the results of the shuffling procedure for each. A brief description of each primer's use is included on each separate sheet of the file. For additional information, see Materials and methods for the relevant section.